Most damage to whitewater inflatables happens on the way to or from the river and not on the river itself. A raft or IK rubbing up against an ammo can for 50 miles of dirt road can easily wear a hole right through the fabric. Protect your boats from UV rays that can prematurely age them plus keep dirt and debris off your boat while in storage or when traveling. 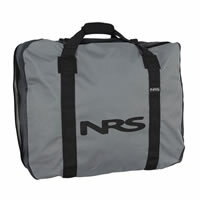 Great for storing or transporting boats from IKs up to 18 foot rafts. Everyone rolls boats up differently. Please measure your boat's L x W x D when it's rolled up to ensure accurate sizing.